A race series for the average runner, featuring the speedy and the inspiring. I’ll self-place myself somewhere in the middle, just out there on the trails of Hyland Lake Park, enjoying the crisp temps and racing vibes. This is my second year running the complete Salomon Autumn Trail Series–four Wednesday evening races ranging from 3.5 to 4.2 miles–and not-particularly-long-story a little shorter, I ran better this year. By better I mean, finishing 3 of 4 races faster than last year, faster overall time, and taking 1st in my age group versus 2nd last year in the series. The biggest change in training was less about the frequency, and more about the distance and type of training–a couple longer races leading up to the series plus a few more weekly hill repeat sessions. Also, new shoes! Specifically, the Nike Terra Kiger 3, an awesome trail shoe for racing. I think another helpful piece was reminding myself with every step that I needed to push through the discomfort of the pace and keep going. Always keep going. Aside from earning the cutest little plant for placing in my group, the other highlight of the series occurred after race #3 when a fellow racer told me I looked strong and relaxed. All the more empowering since I was feeling the fatigue of having run a 1/2 marathon the previous weekend. Although I’m planning to limit the number of races I do in 2017, I definitely plan to include all four Salomon Autumn Trail Series races. Finishing the Twin Cities 10 mile! Found myself (sporting the black compression calf sleeves) in the Kare 11 finish line video. 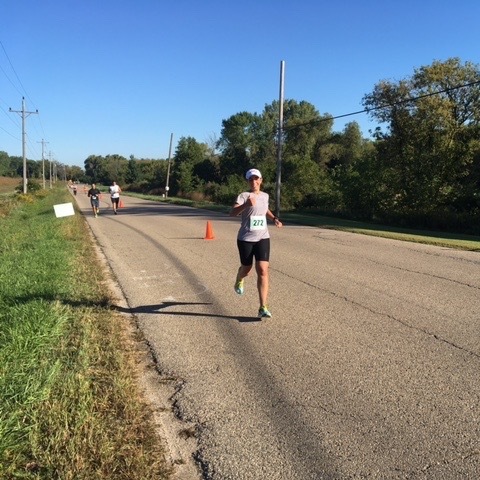 The week leading up to the Medtronic TC 10 Mile I was feeling some marathon envy. Between the road closure signs, the energy at the expo, and social media buzz around the Chicago Marathon and Twin Cities Marathon, 10 miles didn’t sound like nearly enough for a crisp fall morning on the streets of Minneapolis and St. Paul. In the end, thank goodness I only registered for the 10 mile! Another 16 miles would’ve demolished me after spending nine hours on my feet the previous day working at the marathon expo. Also, that detail of training for a marathon was conspicuously missing from my fitness. This likely marks my last race of the year, unless I opt into running a local turkey trot. Gobble, gobble. Lesson 1: A road half marathon six days before a trail half marathon ensures you’ll be running on tired legs, REALLY tired legs. Lesson 2: A cheaper tech shirt that fits a little big at the start of a difficult and humid run will continue to stretch and grow and force you to question the fact that you’re an experienced runner who supposedly knows how to select a race day outfit. Lesson 3: Relying on aid stations may be the lighter, no-carry option, but also leaves you hungry and in desperate need of fuel, especially during Lesson 1’s situation. Lesson 4: Always check you’ve locked the porta-potty door. Always. Lesson 5: You’ll still love the run despite learning these lessons the hard way. Perspective is seeing a guy throw up his breakfast at mile 3, another being held up by four people at mile 8 (and spotting the ambulance shortly thereafter), and another guy tumble and roll a couple times before proceeding on around mile 10. Theodore Wirth Park in Minneapolis is home to the annual Surly Trail Loppet half marathon, 13.1K, and 5K. I’ve had my eye on this trail race for a few years, so despite “preparing” with the Discover Whitewater Series half marathon the week before (eh, timing) I dug out my muddiest Lone Peaks for 13.1 miles of sloppy fun. My race goal was to enjoy a couple hours of trail running at an easy pace. The wave start helped with pacing (I opted for the 2nd of 4 waves)–less temptation to take off fast. The runner traffic jam that grew as we made our way down a narrow, tall-grass/muddy hill within the first few minutes helped keep my as-of-late-desire to take off too quickly in check as well. 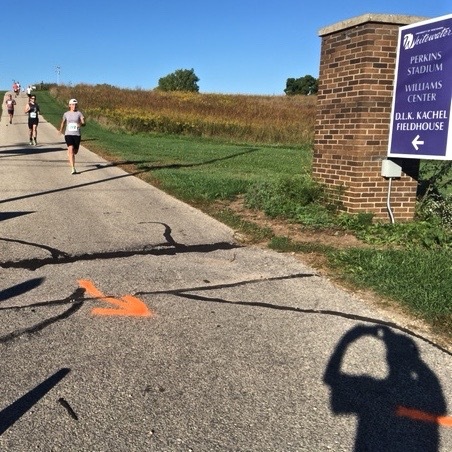 The Loppet Foundation describes the course as a “…challenging course with big hills, narrow trails, rocks and logs.” Accurate. Also, mud–a given after a day or two of heavy rain. There was some concrete–a little bike path here, a little random concrete structure there to hop over, a little sidewalk–but primarily awesome single track dirt and roots, patches of cross-country-esque open fields, and even a boardwalk over Wirth Lake. I struggled. First of all that silly shirt I chose was driving me crazy. To the point I considered taking a couple extra minutes (I was already moving slowly) to slip it off and reattach the race bib to my shorts. Secondly, I was craving calories. I know better than to wait on gels at a typical half marathon, because by the time they’re offered, you’re already in a deficit. Plus, there were no gels… Thank goodness for cut-up bananas at mile 8 though! The best two pieces of banana I ever had. All washed down with the best cup of Gatorade I’ve ever had. Finally, my legs were exhausted from the previous weekend’s race. I got passed. A lot. I hiked it up the hills and cautiously made my way over fallen trees. 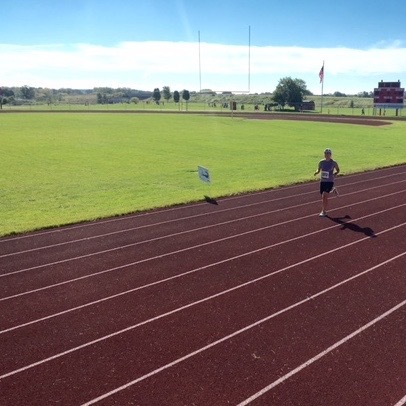 Despite working through lessons 1-5 in one race, I accomplished two of two goals–just enjoy it and take it easy. I traveled 300 miles for the Discover Whitewater Series half marathon (and to see my parents, hi! ), so my duffel bag was packed with three race outfits plus two pairs of running shoes (options, love options). Deciding on the most minimalist outfit–a pair of men’s Brooks spandex shorts (thicker material and longer than most spandex shorts I’ve seen for women), a lightweight Brooks t-shirt (no silly flare at the hips, long enough to cover past the top of my shorts, modest crew cut, and sleeves that happen to be the perfect length and circumference for my scrawny arms), plus the lighter weight shoe option (Altra One)–I grabbed a Honey Stinger gel, partially-filled water bottle and headed outside for the short walk down the street to the starting area. A view of the start line merely steps away from my parents’ house was one of the many race perks. My parents arrived a few minutes later and we chatted with family friends (small town charm at its finest!) until it was time for the half marathoners to line up behind the inflatable START archway. 3, 2, 1… BANG, I took off… MUCH TOO FAST. Of course I felt great… miles 1, 2, 3, even up to mile 6 the legs are relatively fresh. Then they realize, hey, we’re not trained to keep this pace for this distance… And down goes the energy level. Fortunately I had a caffeinated Honey Stinger ready to go and a peppy volunteer at the next aid station hand me a cup of water. 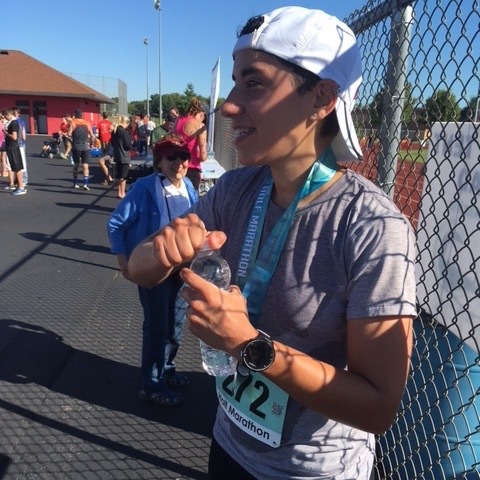 I subsisted on Gatorade (my runner guilty pleasure) throughout most of the race and despite pushing the pace followed by the inevitable slow down, I smiled wide each time my parents appeared, cheering loudly, matching smile for smile. The course, incredibly well-marked and well-stocked with aid stations and volunteers, plus one high school band, made for a solid reminder of why I’ve been loving trails more and more–that concrete and cement of a road race is brutal on the legs. But I suppose so are the STEEP hills commonly looming around any given trail corner, albeit in a much different way. Overall, I wanted to finish in under two hours. Considering my half marathon PR is 1:46, I eventually felt good about my 1:50 finish. 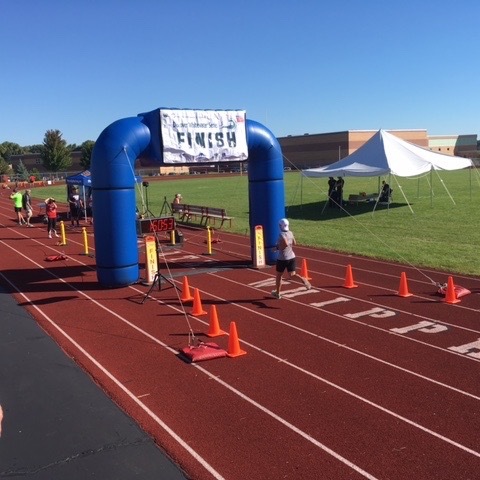 Plus, after slowing down by 30-45 seconds or so per mile in the latter part of the race, I was pleased to find a burst of leg speed in the final mile for a solid finish down Walworth Avenue, through the high school parking lot and for a lap around the bouncy track. I never doubted I could handle the distance, so there’s that bit of a confidence boost going into this weekend’s Surly Brewing Co. Trail Loppet Half Marathon… Hills, hills, and more hills. Thanks to my dad for the great photos! My mom made sure the car was full of snacks for the long drive back to the Cities, so I started the energy replenishment on the go (blueberries, a green juice, water, plantain chips). Ideally I would’ve taken the time for an epsom salt bath upon arriving home, but maybe I’ll learn my lesson the next time around…starting this weekend after another 13.1 miles in Theodore Wirth Park!